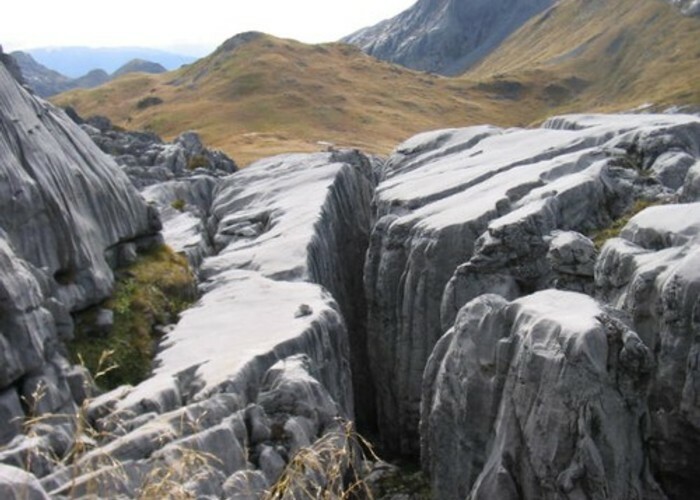 Mount Owen (1875m) is the highest point in Kahurangi National Parks, a bare landscape of marble karst including New Zealand's longest cave system. 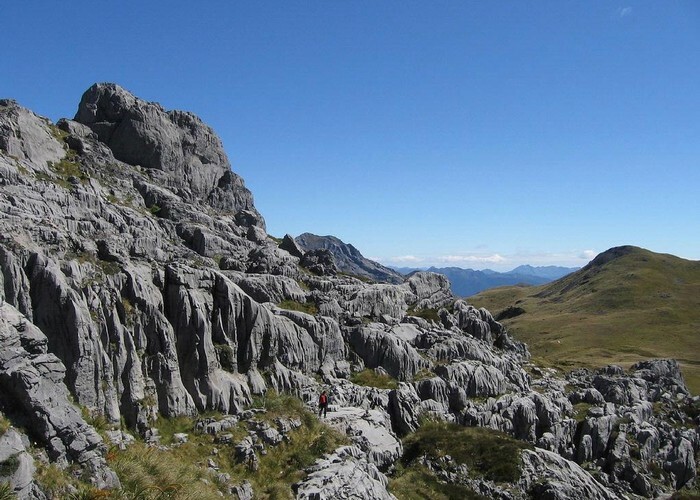 The climb is not difficult and there is ample space to explore once on the mountain. Mount Owen • By Delwyn. Courthouse Flat, Wangapeka River Road west of Tapawera. Courthouse Flat is 15 minutes' drive past the start of the Wangapeka Track. Mt Owen • By apurdam. Licence: cc by. From here the most common route is up the ridge between Granity and Blue Creeks, although there is an alternative up Blue Creek through forest to gain the ridge-top track. The ridge track climbs through scrub and forest to Billies Saddle before descending steeply into Blue Creek and continuing in forest. Emerging into the subalpine scrub at the head of the valley, follow the dry creekbed to entrance of Ghost Valley and Granity Pass Hut on a terrace above the true right of the stream. From here, cross opposite the hut and go east into Sanctuary Basin, then south around Sentinel hill towards Mt. Owen. Find your own route through marble outcrops on the final climb to the trig. The route is difficult to follow in misty or bad weather. Added 22 January 2006 by maccamacca. 2 revisions, most recently 27 April 2006 by MatthewMatthew. 188 views in the past year (16 per month).